We encountered an illegally parked Reliant school bus in Downtown Brooklyn on Wednesday and decided to run the plate through Streetsie Award winner Brian Howald‘s indispensable @howsmydrivingny account: It turns out, the public school bus had run red lights or been caught speeding nine times! Hello, anyone awake at the switch at the Department of Education? The NY Post is the latest outlet to report on an increase in traffic injuries — and pedestrian deaths — despite the city’s Vision Zero approach. The story included this head-scratcher, “Department of Transportation officials said that, overall, city streets are still safer, despite the higher crash count.” Think about that. One of Manhattan’s great new public spaces — the Canoe! — is officially done on the West Side of Manhattan, reports our friend at CHEKPEDS. 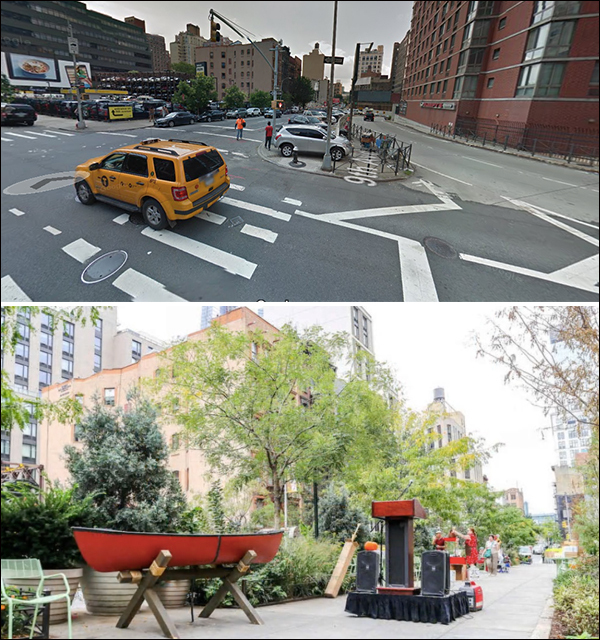 It took years, but the city finally took away a lane of on-street car storage to give traffic-challenged Hells Kitchen residents a place to sit and relax. Check out the before and after shots at the bottom of this post. Second Avenue Sagas started the year off with a bang, offering a deep dive into why the MTA seems to be more obsessed with fare evasion than with its persistent ridership decline. Gothamist followed our coverage of the New Year’s Day death of e-bike rider Hugo Garcia, but failed to point out that Garcia’s death would be classified as a motorist death, not a cyclist death, thanks to an NYPD policy that has not been explained. (Gothamist) Meanwhile, NBC News reporter Rebecca Davis joined the chorus of voices calling for the city Department of Transportation to make our roads safer. That driver who caused the fatal crash in Lower Manhattan late last year was going anywhere 100 (NY Post, NYDN) at the time, authorities said. 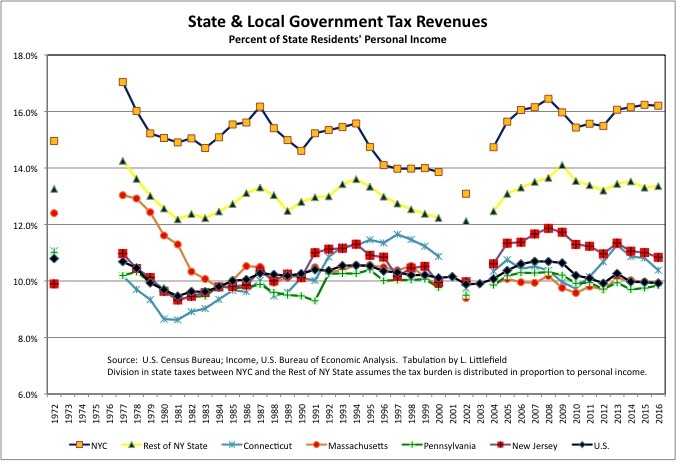 Based on this tax burden? Generation Greed members of the political/union class grabbed a bunch of money off the top and claimed that it would cost the rest of us nothing, because the rich would pay for it all. 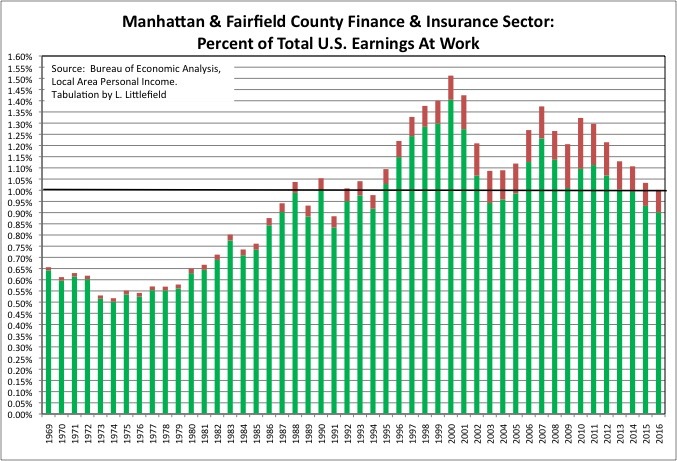 Out of excess income they never earned in the first place but would continue to get somehow. Very similar to the Republicans claiming their tax cuts for the rich would be paid for exclusively by magic, or the undeserving poor, or foreigners. But in the end, that isn’t what happens, is it? From early October. I disagree. If you travel the best transit systems in the world, by far, have a profit motive and are typically profitable. But if there is one organization that makes the MTA look like a effective operation it is the PANYNJ. From the beginning they have been focused almost exclusively on eliminating fatalities—even though vision zero’s mission included fatalities and injuries. So it seems that they are now willing to accept some level of injuries as long as fatalities are decreasing. I can tell you that street redesigns in my neighborhood alone have increased traffic, which leads to more honking, and increased minor crashes. It’s actually also less safe for pedestrians because now there are two directions of traffic in a tight space, where before there was only one. Vision Zero is about eliminating fatalities and *serious* injuries. So we’d need to look at how many people are being saved from the kinds of injuries that cause them to lose limbs, the ability to walk, or brain function and see how those have gone up or down. It may be that at some locations fender benders and minor injuries have increased while fatalities and serious injuries have decreased. What I want is a couple of simple crosstabs. One for those killed. And one for those hospitalized, excluding those treated and released. The columns would be pedestrians, bicyclists, drivers, motor vehicle drivers, motor vehicle passenger, transit rider, etc. The top row would be no one, which for pedestrians would tabulate deaths and injuries from falls on public rights of way, and for drivers and passengers would be one-vehicle crashes. Then bicycles by type — commercial, commuter, athletic training, bike share. And motor vehicles by type — taxi, private sedan, SUV, city vehicle, truck, bus, etc. Hospitals could be asked to fill out the forms for public ROW, as part of the public health information they fill out. No transit system should ever be run with the explicit goal of turning a profit. The only legitimate goal is to meet the needs of the riders. Mass transit is a public service; it costs what it costs. Of course, if there is a surplus, then by all means pour it back into the system. As I wrote, in my travels the higher the farebox recovery the significantly better the transit system. The lower the farebox recovery, the worse it gets. It’s easy to have a for-profit system which only serves the upper classes. The MTA needs to serve everyone, whether they make $1 million per year, or $1 an hour. That places a limit on the fares they can charge. Ridership numbers and mode share of for profit system (not necessarily privately owned) do not agree with your statement. Two things which might be tried which nobody is considering. One is a wealth tax, say a few percent of any wealth in excess of perhaps $10 million. Another is a real estate profits capture tax. When any piece of real estate is sold, NYC gets 90% of the difference between the sales price, and the purchase price corrected for inflation. As an example, my parents bought their house for $52K in 1978. Corrected for inflation it would be worth about $200K now. However, houses similar to it are selling for perhaps $700K. NYC would get 90% of the difference of $500K, or $450K in taxes, if the house were sold. Three advantages to doing this. One, it would end real estate speculation as there would be very little profits in it. That in turn would drive down housing prices. Two, it would prevent your Generation Greed from cashing in on artificially high housing prices they helped create. Three, it would benefit people like myself faced with buying out their siblings to stay in the house after their parents die. Right now I would need to somehow come up with about $450K to buy out my siblings. I don’t have that kind of excess money and doubt I ever will. However, under a system where the actual proceeds from the sale of the house would effectively be about $250K I could probably buy out my siblings. Unfortunately, other countries have far lower construction and labor costs than NYC, which means a reasonable fare can cover more of the costs. Also, people are willing to pay a little more for a decent system. Before we can even contemplate raising fares, the subway would have to be a lot more reliable, as well as at least 50% faster, than it currently is. The MTA has lots of problems it needs to solve, starting with a bloated staff, antiquated work rules (i.e. we don’t need conductors on trains, and we won’t need T/Os either once we go to CBTC), very high construction costs, pensions which were raised retroactively but never funded, etc. Unless it’s a primary residence with certain other provisions, that’s already taxed as capital gains. When you inherit a house, the basis increases to whatever the market value of the house is when it’s inherited. I think that only applies if the house was a primary residence but that’s the case for the majority of inherited homes. If the house is sold soon after it’s inherited, you pay little or no capital gains taxes. As for capital gains, keep in mind the maximum rate is only 20% unless the asset is held less than a year. Even if taxed as ordinary income, there is still substantial profit in real estate speculation or nobody would be doing it. The idea of a 90% tax is to get rid of the profit. There should be no proposal to increase any tax without an acknowledgement that the overall tax burden is already higher here than anywhere else. Despite tons of special tax deals that reduce that burden for certain people. And all new revenues increase that further. I agree cost cutting should come before tax increases. The MTA and NYC can do a lot of cost cutting. It’s always amazed me how we tolerate such notoriously bad drivers to operate school buses and transport children. I see these assholes speeding and blowing red lights every day. And check out Houston St between Pitt and Columbia. The entire bike lane is blocked all day by school buses. The drivers sit there for hours playing on their phones and smoking. There seems to be no oversight whatsoever from the city on the behavior of these school bus companies. They’re just left to their own devices. The cops don’t enforce them either. It’s not just dangerous driving these school bus drivers are guilty of but also obnoxious behavior. Since the law was changed in NYC prohibiting passing a stopped school bus it should be incumbent on school bus drivers to drop off their charges in as timely a manner as possible, consistent with safety. My brother has noticed many times the drivers will needlessly delay traffic BSing with parents for a few minutes. It’s not just car drivers who suffer from this, but also regular MTA bus riders stuck in traffic jams created by the school bus drivers. All this isn’t even getting into the fact we bus a lot more kids than we need to. You should have to go to the local school in your neighborhood through middle school, just as was the case when I was in school. There was none of this school choice or magnet school nonsense. When there’s only one school, the parents will put pressure on the staff to fix any deficiencies. Not so when they can just send their kids to another school. This would make building more housing impossible. I was sort of joking, Larry. No, what neighborhood were you referring to? But only sort of, right? (re: PATH) “That’s why government builds it in the first place.” Um, no. That infrastructure was built by the Hudson & Manhattan Railroad Company, not by the government. The government didn’t get involved with it until 50 years after a private company built it. Oops! Sorry. It’s at kew gardens/richmond hill. Specifically, corner of 115th and 84th avenue, and park lane south and 115& park lane. DOT added a pedestrian island with a traffic light at park lane & 115, and made 115 from park lane south to 84th have a 2 way street when it used to be one way. The light and island have been good because crossing prior to that was terrible. But it also slows down buses that now have to wait for a light, and causes traffic backups all the way down 115th and on 84th during rush hour. Not to mention the fact that 3 of 4 crosswalk markings at the 84th &115 are faded and people blow the stop signs. In non rush hour times, people are now rushing up 115th or around the corners on 84th to try to beat the light on park. With new apartment buildings going up a few blocks away, and close proximity to forest park, I am concerned that this will get worse. They need to make it a 1-directional street and stripe crosswalks at 115th & 84th and/or take away a lane of parking one side of 115th. Without a train operator, who stops the train when they see someone on the tracks? That could be automated also. We already have pedestrian avoidance technology in automobiles.